Tag Archive | "blood donation"
There is so much to love about Michigan in the summertime! It’s no surprise that as the weather warms up, the community blood supply experiences a “summer-slump” as many people are out and about enjoying all that Michigan has to offer. That’s why several Michigan based businesses are teaming up with Michigan Blood to give people a chance to show their state pride while boosting the local blood supply. Anyone who attempts to donate during the annual Love Michigan blood drive at Michigan Blood donor centers throughout the Lower Peninsula will receive a thank-you gift bag with Michigan-made products. 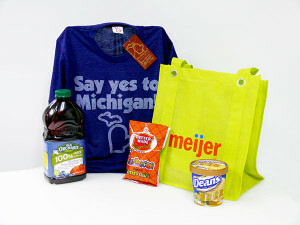 The reusable bag provided by Meijer will include a special-edition retro “Say Yes to Michigan” t-shirt (a $28 value from The Mitten State) along with other donated products from Old Orchard Juice, Better Made Potato Chips, and Country Fresh Ice Cream. It takes more than 2000 donations to Michigan Blood every week to support local hospitals including Spectrum Health, Mercy Health St. Mary’s, and Metro. The Love Michigan event will help assure that those numbers stay strong even in the heart of the summer season. Dates and times vary by location. Appointments are strongly recommended.